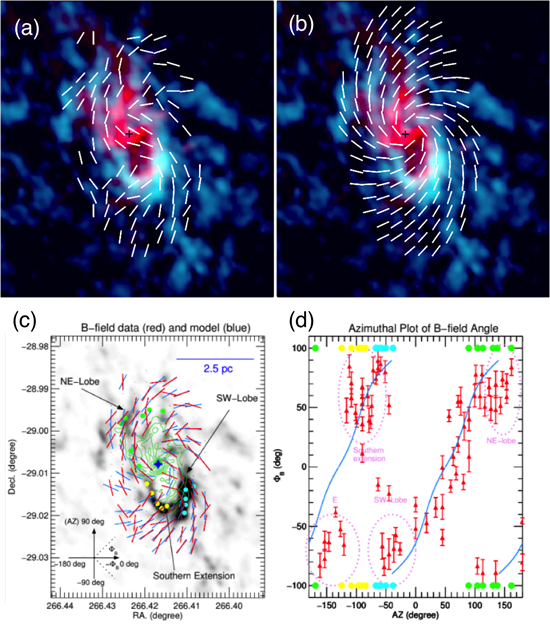 (a) and (b): Color-composite image of SMA HCN(J = 4−3) tracing the circumnuclear disk in the Galactic center (blue; CND) and the 6 cm map tracing the mini-spiral (red). The B-field orientation of the JCMT data and the best-fit model are overlaid with the white segments in the (a) and (b), respectively. respectively. The SgrA* is labeled with the black cross. (c) The JCMT B-field segments (blue) and model (red) are overlaid on the CND (gray image) and the mini-spiral (contours). The B-field model is aligned with the CND well, which suggests that the same field lines, continuing inward, also align with the mini-spiral. (d) Azimuthal-plot of the B-field position angle (ΦB; red points) with the model overlaid (blue curve). The B-field shows a predominantly azimuthal field being wrapped along with the CND. The systemetic deviation of the B-field in the NE-lobe (E), SW-lobe can be attributed to the accretion history. The clear connection of the neutral CND and ionized mini-spiral with the B-field is presented for the first time (Hsieh et al. 2018, accepted for publication in ApJ). Utilizing James Clark Maxwell Telescope (JCMT) μm SCUPOL dust polarization data, we investigate the configuration of the magnetic (B-) field in the circumnuclear disk (CND) of the Galactic Center (GC). Overall on a large scale, the B-field shows a clear predominantly toroidal morphology. Compared to earlier 100 μm observations, the SCUPOL data show a hugely improved polarization coverage at a higher resolution. In general, the observed B-field morphology is well described by a self-similar axisymmetric disk model where the radial infall velocity is one quarter of the rotational velocity. A detailed comparison with higher-resolution interferometric maps from the Submillimeter Array (SMA) further reveals that the B-field aligns with the neutral gas streamers where they are connecting to the CND. Moreover, the innermost observed B-field structure also appears to trace and align with the ionized mini-spirals located inside the CND. This suggests that there might be one underlying B-field structure that is connecting the CND with its streamers and the inner mini-spirals. An estimate of βplasma ~1 -- based on the global B-field morphology that constrains the azimuthal-to-vertical field strength ratio to be around 40 combined with a measurement of the azimuthal velocity -- indicates that the B-field appears dynamically significant towards the CND and also onwards to the inner mini-spirals. The connection of the CND and the mini-spiral by the B-field is revealed for the first time (Hsieh et al. 2018, accepted for publication).